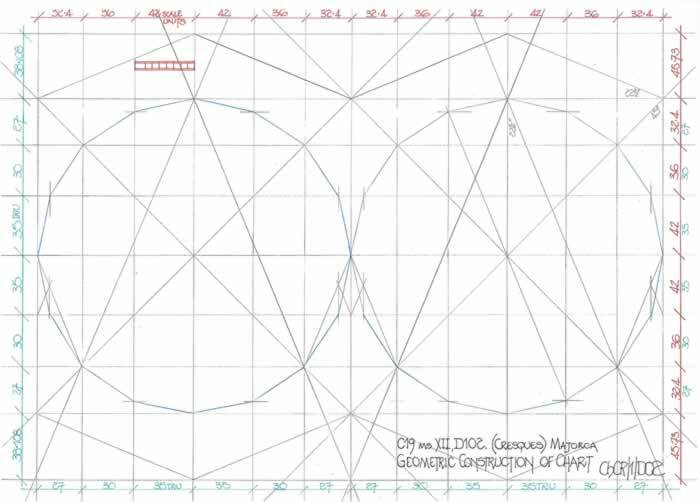 The Cresques C19 chart is now analysed for draughtsmanship and construction to discover the fundamentals underpinning its format, and, it is then compared to a variety of earlier charts to determine its lineage. “In 1399, during the reign of King martin, we find Jafuda Cresques (son of Abraham, and now named Jaume Ribes after his conversion to Christianity) mentioned in the royal and commercial documentation as residing in Barcelona. 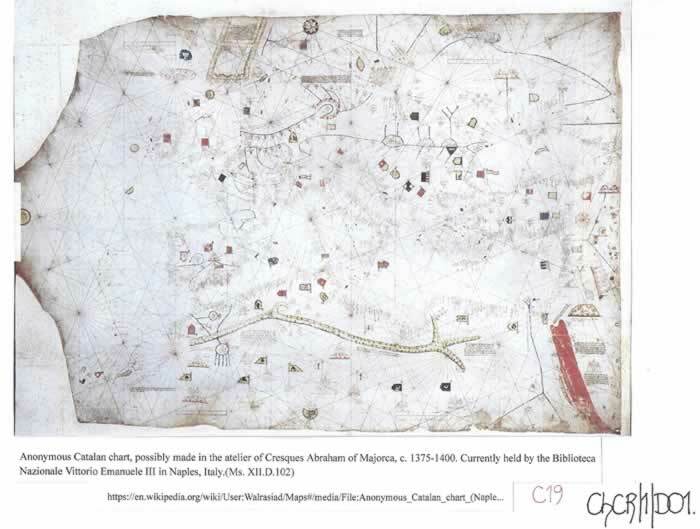 He had received a commission by the firm “Datini de Prato” to make some elaborate and expensive maps. At the same time, the Genoese cartographer Francesco Beccari receives a letter where he is commissioned in secret to make three additional maps based on the exemplar charts being made by the Majorcan (former) Jew. Those charts had to be presented to the kings of Navarra and England, no less. But let us see who were Cresques and Jafuda that deserved these royal commissions? Some fortunate documental findings have allowed us to clarify what their occupations were and the nature of the commissioned works. They were, as we had put forward, painters specialised in charts and Mappaemundi of exceptional quality. Ramon Pujades calculates that the atelier of Cresques Abraham must have lasted three decades. First, we know that he took as an apprentice Bonjuha Gatbay in the year 1368; in 1375 we have information that he worked with someone named Astruc Cresques; and finally in 1390, the assistant Samuel Corcos receives ( from Jafuda Cresques) final pay for works performed over the previous six to eight years. After the destruction of the “CALL”, in the same manner that Jafuda took the name Jaume Ribes, Riba or sa Riba during his baptism– after his godfather, who was Canon of the Cathedral, his pupil Samuel Corcos took the name of Macia de Viladesters– after his godfather, who was legal adviser of the governor. After Jafuda’s death, Macia and his brother Joan continued to author maps, as we can see in the charts preserved in the Topkapi Museum of Istanbul. They worked until the 1440’s approximately. 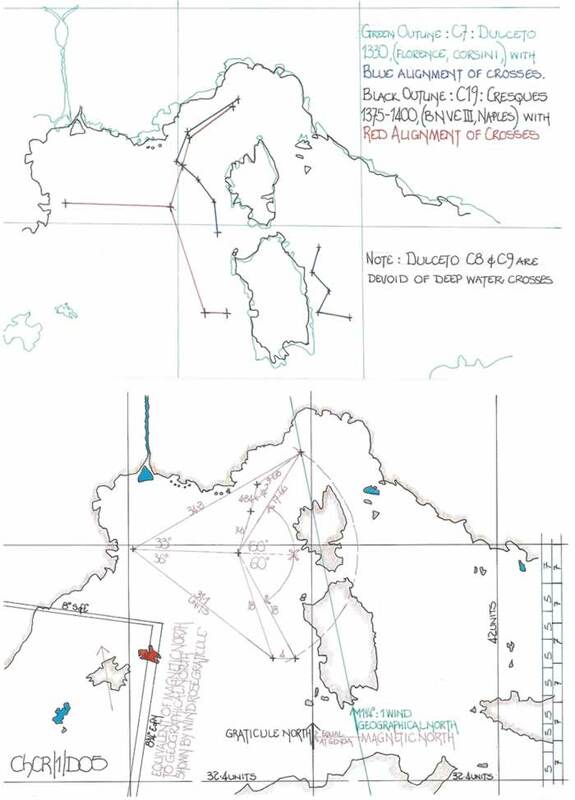 We know the price of some maps based on the contract of the firm “Datini” for the collaboration of Jafuda Cresques and Francesco Beccari: one map 660 shillings (sueldos), another map 1100 shillings (sueldos). However, the first one took one year to be finished. Based on this, Pujades concludes that they were not paid properly- it’s no wonder. 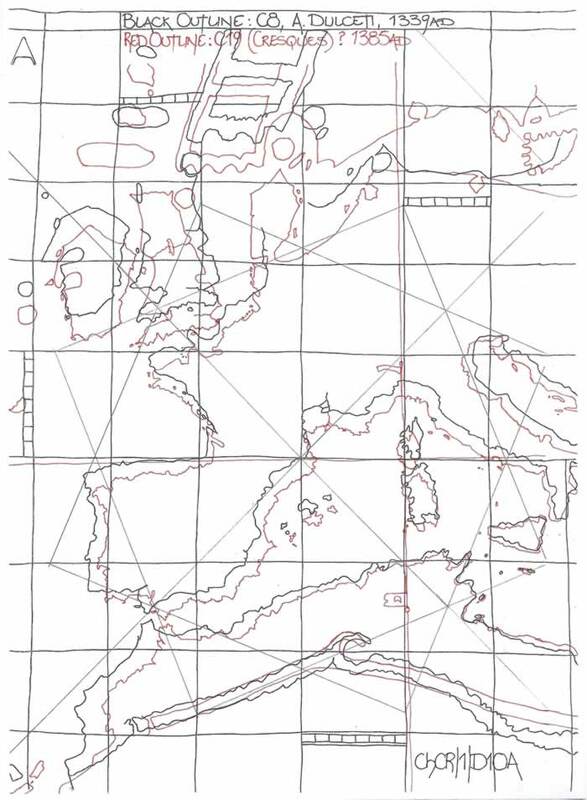 But did our Jewish cartographers have any special technical knowledge or were they simple draughtsman? It seems that they were nothing beyond excellent illustrators but lacked technical knowledge (of cartography) in the modern sense. In other words, if we were lucky to find the inventory of their atelier or library, we would find the maps that they used as patterns. To make this point more clear, among the makers of Medieval Mappaemundi and nautical charts, the Cresques’ were not the innovators. The innovators were others that preceded them”. It is referenced as C19 in “Les Cartes Portolanes” and illustrated on pages 164/165. 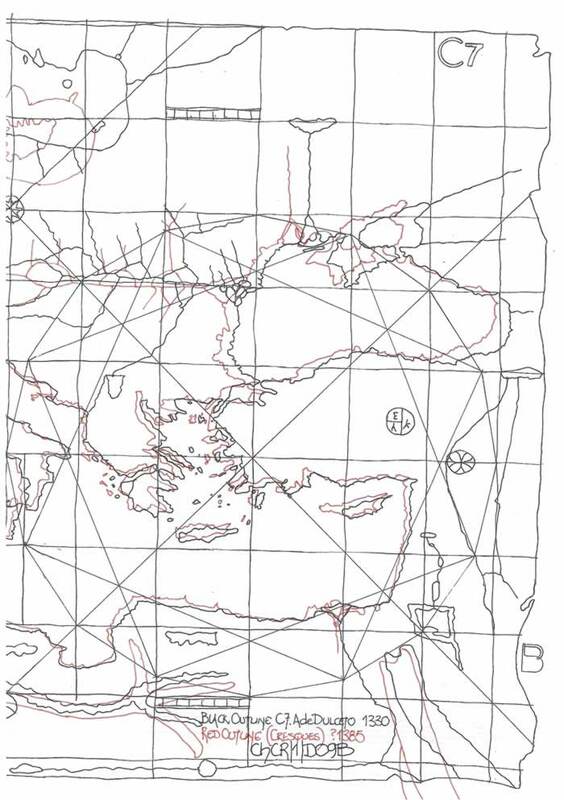 It is one of the larger Portolan charts being 85 x 125 cms., and portrays within a double wind rose graticule the Mediterranean Sea basin extending from before Canary Isles in the west to the Black Sea in the east. 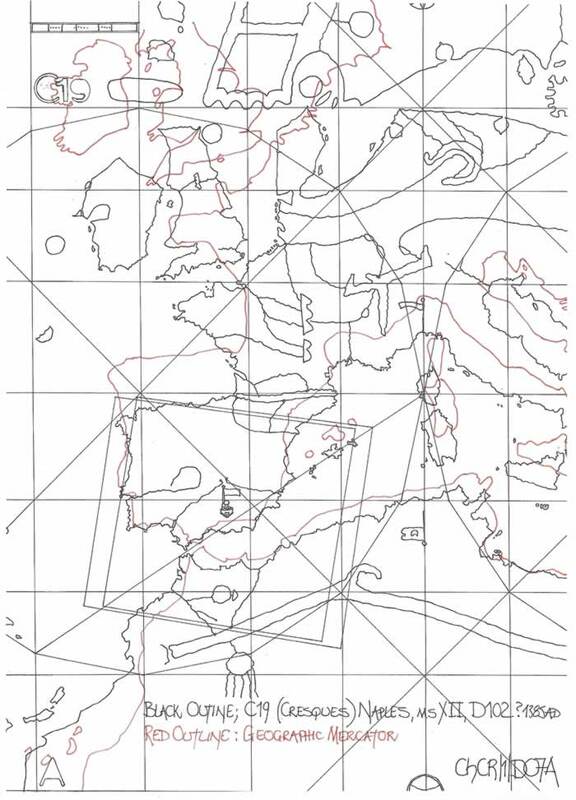 The longitudinal spread is 18W to 42E for the geographical features, with considerably more added in the west to encompass the western wind rose. The latitudinal spread is from c24N to c66N, thus indicating the two lines of latitude that are determined by the Sun path. It is possible that a mathematical setting out was on the original template from which this chart has been copied such that the longitudinal spread is 60 degrees and the latitudinal spread is 42 degrees, that is a 10:7 ratio. The chart will be shown to be a square graticule chart with equal degree measurements. There is however a small degree of variation from 100:95 to 100:93 ratios, but it is generally 100:100. 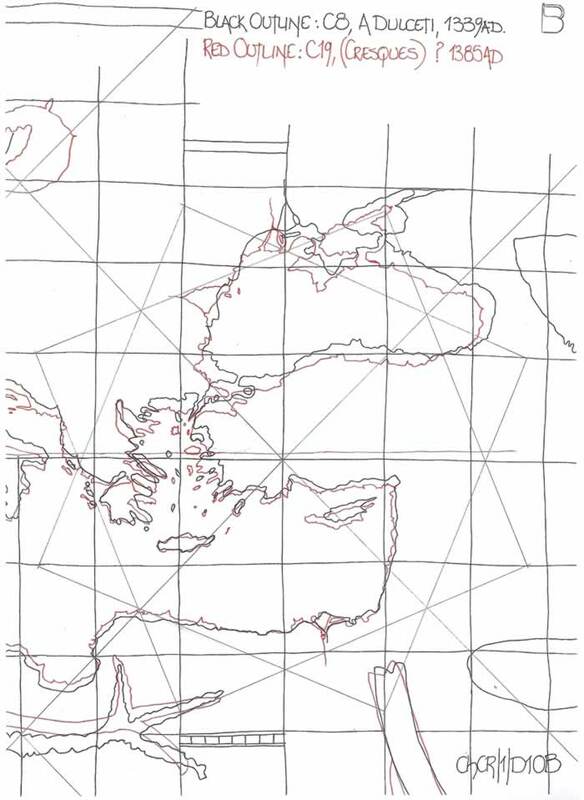 The centre line of the two wind rose graticules is clearly marked by two flags: that of Genoa and an Arabic motif, north and south of the Mediterranean Sea. Naturally the north/south alignment is also marked by the traditional circular motifs of the winds. There are two features upon the chart not normally found on a Portolan; that of an interlinked pair of rectangles set over the Iberian Peninsula and a series of black crosses set in the sea to the north and west of Corsica. These two points are discussed separately later. With this chart, perhaps 75 or 100 years after the Riccardiana ms 3827 chart (1300-1310) we see that the development of the European western coastline to the Baltic Sea has taken a great leap forward and now reflects geographic reality. There are features upon the chart which almost certainly make it a direct descendant of the Angelino Dulcert(!) charts, illustrated in L.C.P. as reference C7, C8 and C9 and will be cross compared later in the text. The two developments noted upon the chart may question the Llompart suggestion regarding the technical ability of Cresques, but the one could also be firstly a spurious notation and the other a partial copy from the Dulcert Charts. We should not preclude mathematical ability etc from the Cresques family as they were obviously very talented. 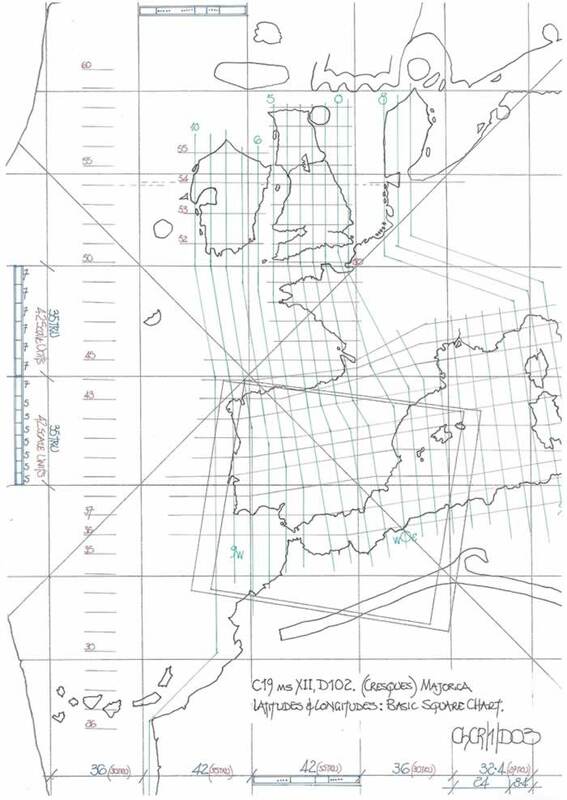 As is normal with Portolan charts the scale bar is set to measure the graticule of the wind rose. That fact is fully researched in my texts ChWr/1 and ChWr/23 which include the medieval mathematics governing the setting out as an appendix entitled, “A guide for the perplexed”. The wind rose graticule is set out by a simple series of ratio measurements that are, 35:30:20:7 Trignometrical ratio units (Tru’s), forming a square of 92 Tru’s, of which four form a normal wind rose graticule. This ratio can be manipulated quite simply to accord with any scale required. Thus if the chart is one of the larger format Portolan charts then the graticule can be increased in size, just as C19 illustrates. Here the scale bar has 42 units set in the 35Tru graticule section and thus it is a simple 20% or 5:6 ratio enlargement by measurement. But in so doing the draughtsman has produced ratio units not of whole numbers as the standard 35:30:20:7, but instead they are 42:36:24:8.4, and hence it is certain the graticule is set out not by measurement but by trignometrical drawing. This can be clearly illustrated by the extension to the wind rose graticules, north and south whereby the graticule is determined by the 22 ½ degree line across the (92) 110.4 main square, the quarter of the whole wind rose. If the Rule of Marteloio4 is studied the basic trigonometry for a 22 ½ degree alignment is given by the ratio 38:92, but calculated it is actually 38.108:92 or 45.73:110.4 to suit the 42 measurement by the scale bar. The centre lines of the whole chart were therefore set out upon the skin and a simple single measure for the overall wind rose chosen and then geometrical construction took place to form the wind rose. But was it just copied? The actual scale of the chart can be assessed via a simple single measurement as I have clearly shown in my ChLcP/1 text utilising the Djerba to El Arisch distance of 2200Km. V M Rossello5 in his text “Les cartes portolanes Majorcan”, noted that with a cartometric analysis of these charts the “Miglia” was 1340 metres. But B R Motzo6 in 1947 had proposed that the measure was between 1000 and 1250 metres. By aligning the chart measurements from Djerba to El Arisch, 2200Km, and using the charts scale bar, it can be shown that the distance by scale measurement is 165 units, which equates to each unit being 13.333Km. Thus each scale unit is 10 miglia of 1333 metres. 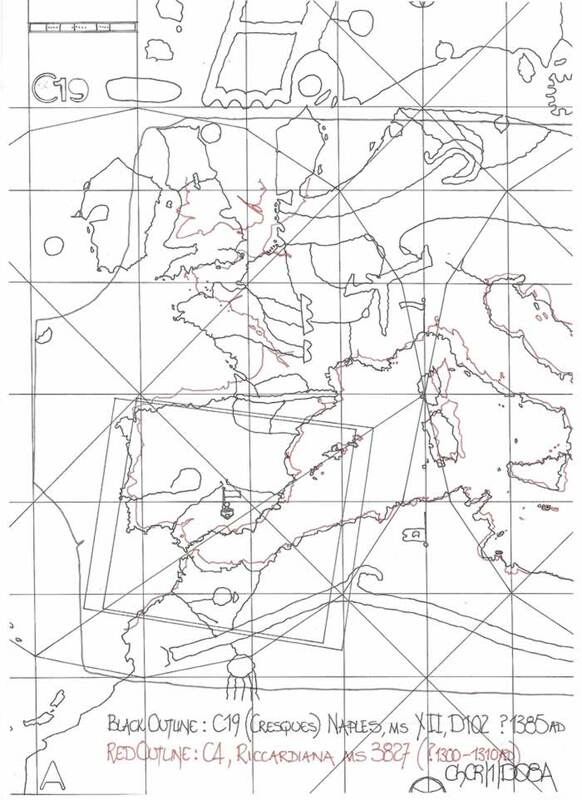 On most Portolan Charts the west coast of the Iberian Peninsula is drawn geographically correct for orientation alignment. That is, the west coast has a proper N/S alignment which extends to the south coast being E/W. 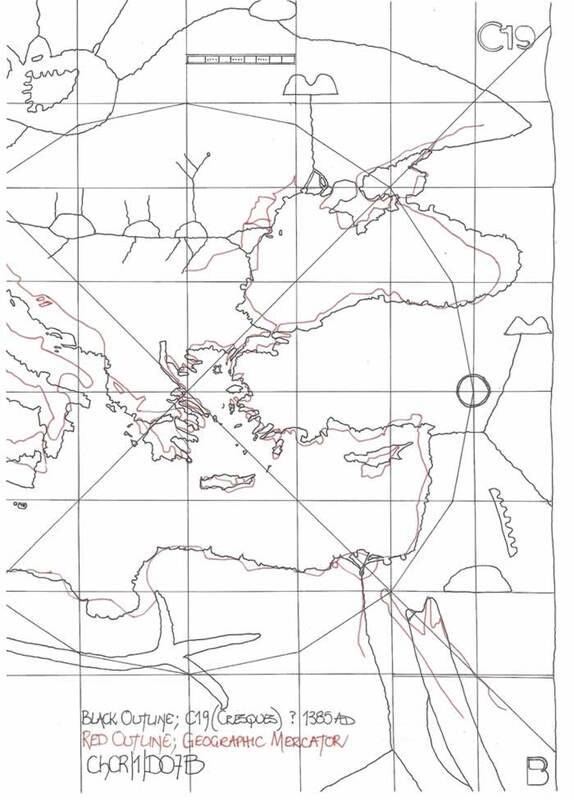 Thus it is possible to estimate, by drawing, the latitudinal degree and construct a putative geographical graticule. It would have been quite possible at this stage of the investigation to opine that the 42 scale bar units represented 6 degrees of latitude as the scale bar is subdivided into two possible sections; (7 x 5) +(1 x 7) and thus (6 x 7). However the latitudinal lines are close to being 7 scale units or 70 miglia apart and I have therefore chosen to accept that which is drawn rather than speculate on a slight inaccuracy in draughtsmanship. It should be noted that at 13.333Km per unit scale the degree is in fact 7 x 13.333 or 93.33Km when the actual degree is c111Km; that is 85% accuracy. 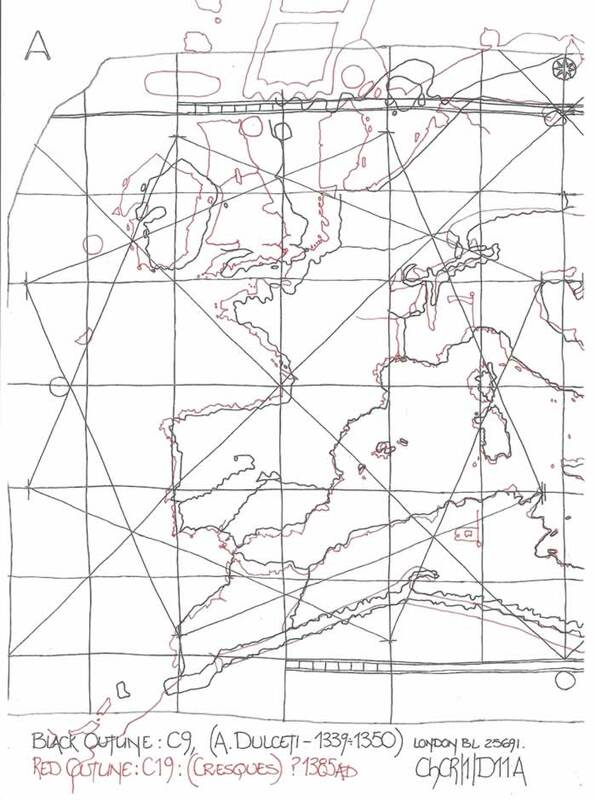 This exercise does show that at this period in the history of cartography and Portolan charts accurate latitudinal positioning was available, no doubt from the various tables7. Covering basically the Iberian Peninsula and part of N. Africa is a double inter-linked rectangular figure which overall measures 88 x 96 scale units. It is not drawn as two separate rectangles but by a continuous line thus having no beginning or end, but corners. There appears to be no reason for the positioning and its alignment is contre the charts alignments. Thus the setting out does not accord with the graticule, or any wind alignment as can be clearly seen by studying the chart. In fact the positioning appears to be almost guesswork. But if the angles of the alignment are measured they are 8 degrees south of east and 8 ¾ degrees east of north. These angles reflect quite accurately the magnetic deviation at Majorca in the 1300’s. The magnetic alignment is of course east of north at this time. Has the draughtsman shown that he was fully aware of magnetic declination and chosen to indicate this via the rectangular construct which is itself an anomaly? Meanwhile, compasses with two needles and two wind roses enabled them to make allowances for the differences in declination. The description given by Petrus Peregrinus in the second half of the 13th C may already have assumed that one knew the necessity for correction. It was thought preferable, therefore, to rely on experienced pilots to correct, from time to time, the errors made in the ship’s course as a result of using these disorientated charts and of following the false north shown on the compass. For these corrections, the pilots would rely on observations of the sun (and perhaps also the North Star), but especially on their knowledge of the coastlines- already visited on previous sailing trips- and the indications reported in the portolanos. Unless, that is, — as Magnaghi, among others, assumed—magnetic declination on the high seas was corrected using the small black crosses, that are drawn far off the coastlines on many nautical charts, especially in the open Tyrrhenian Sea and west of Sardinia and Corsica (along the shore it would have been enough to refer to known places and landmarks, as we said earlier). The black-ink crosses always form right angles, but are tilted to the west, though in varying degrees. Thus one can imagine that for some positions on the open sea, for which the size of the magnetic declination was known, they meant to indicate to pilots that the true north, at such a point and at that time, was not what was indicated on the compass, but rather corresponded to the vertical axis of this symbol (the crosses could be drawn on any nautical chart, copied from a prototype that had none). If this hypothesis is not accepted, the meaning of these crosses remains uncertain. Since they are found (as I said) in the open sea, in deep water areas, they would have nothing to do with the lines drawn along the coasts – together with festoons of dots – to indicate cliffs or sandbanks ( as is done in modern hydrographic charts). Nor would they correspond to reference points along the route, marked from time to time as one traveled which, we know, were pencilled in and later erased. End quote. However, my systematic examination of the draughtsmanship shows that there are other possibilities for their positioning. If the scale bar is used to measure the distances between the crosses, two are identical with a third very similar; two are a 1:2 ratio and the larger are possibly a multiplication of the smallest measurement. 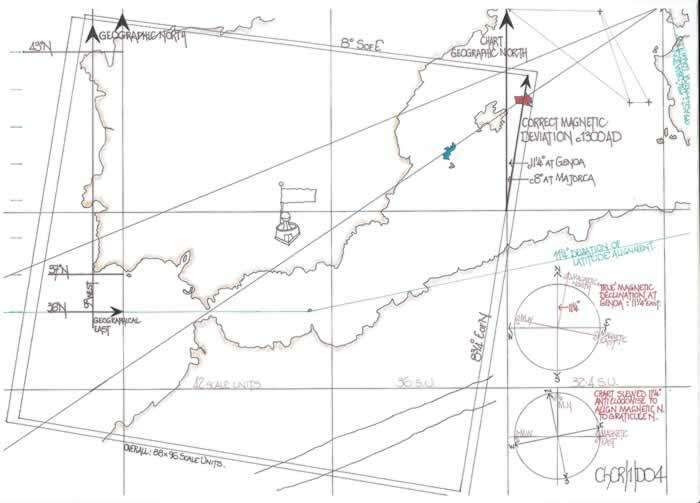 The angles subtended by the north and south crosses to the projected east/west line are both 60 degrees, but nowhere is a right angle or normal wind direction noted. I cannot therefore support the above remarks made in the quoted text and suspect these crosses may delineate sea ownership for safe passage by various fleets. Rivalry amongst the emerging Maritime States was rife in this period and could encourage piracy! But it must be clearly stated that the Cresques C19 chart has used the Dulceto atelier’s template for these black crosses to be added to their chart as they only appear on the C7 chart of Dulceto and not the later C8 or C9 charts. Thus it must be quite apparent that the Cresques atelier was the recipient of the Dulceto ateliers templates, by one means or another. If the two charts illustrated upon ChCR/1/D01 and ChCR/1/D06, the Cresques chart and the Dulceto chart, are studied it will clearly indicate the former is a copy of the latter and its predecessors. Thus I have chosen to continue a form of research developed in texts ChCs/1 and ChCs/2, whereby a chart is subjected to comparison with a Mercator Chart, Riccardiana ms3827 and charts of a similar age. Thus I am comparing chart C19 with those and charts C7, C8 and C9. As noted on previous comparisons, the Mediterranean Sea length is reasonably accurate with longitudinal positioning acceptable. Latitudinally, Italy/Corsica/Sardinia are set several degrees northwards as seen previously. The Iberian Peninsula, France and the Low Countries have been squeezed latitudinally to accommodate the Scandinavian area and the Baltic Sea. in effect as is seen on previous charts and is to be expected as this is a copy of previous charts, the Mediterranean Sea is in fact humped in its central section, whereas the east and west extremities are more correct. CRESQUES C19 -/- RICCARDIANA ms 3827, C4. 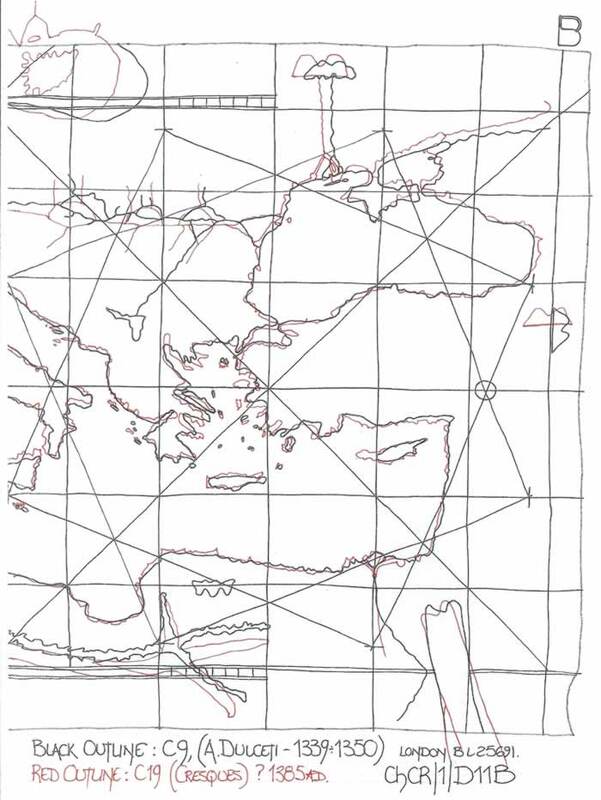 I concluded my texts ChCs/1 and ChCs/2 with the opinion that the Riccardiana ms 3827 chart C4 was in all probability the master template chart, drawn in Genoa and used by all who commenced work there as cartographers. As the C19 chart is a copy of the C7, C8 and C9 charts of Dulceto and I have shown they were based upon the C4 chart, the expected comparison was confirmed. The basic outline of these charts considering they are probably 50 years apart by date is surprisingly accurate and indicates as already surmised that the same templates were used. The fact that the black crosses are included indicates it is the same chart in effect. However C19 has an adjusted Scandinavian/Baltic Sea profile whilst being C7 also. 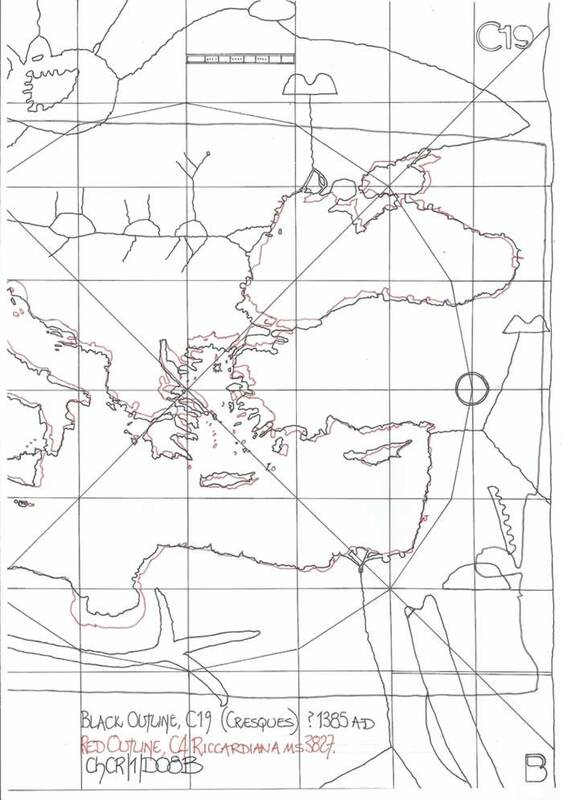 In my text ChCs/2 regarding the C7, C8 and C9 charts by Dulceto, I remarked how the C7 chart had a slightly elongated Mediterranean Sea from Italy to the Pillars of Hercules, and C8 was even further extended in this area. This comparison therefore indicates that it has the lengthening of the Mediterranean Sea, whilst being a reasonable copy in the other parts. It also hints at the usage of all of the templates from the Dulceto atelier, or as I previously opined the C9 chart being the most accurate was in fact the youngest to be followed by C7 and C8 which were progressively longer in this area as discussed. 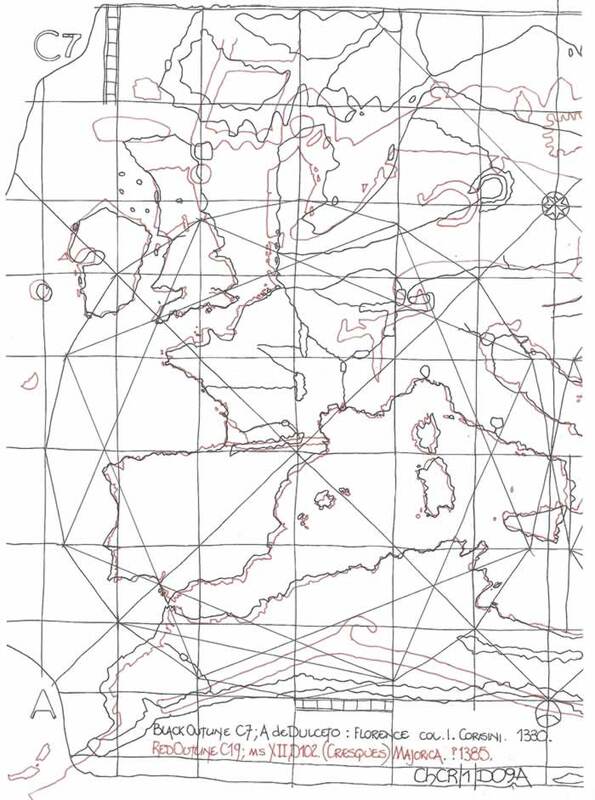 The C9 Dulceto chart was the most accurate apropos the Mediterranean Sea basin and thus the coincidence to C19 appears to be the original template, but augmented by other section as has been discussed. The survival of a template or templates for 50 years indicates that they are of some quality as my text Leather Parchment and Vellum indicated. From the comparisons of C19 to C7, C8 and C9, Cresques to Dulceto, it is obviously correct to opine that somehow the Cresques family obtained the Dulceto templates, or even took over the complete atelier with all of its accoutrements still available. 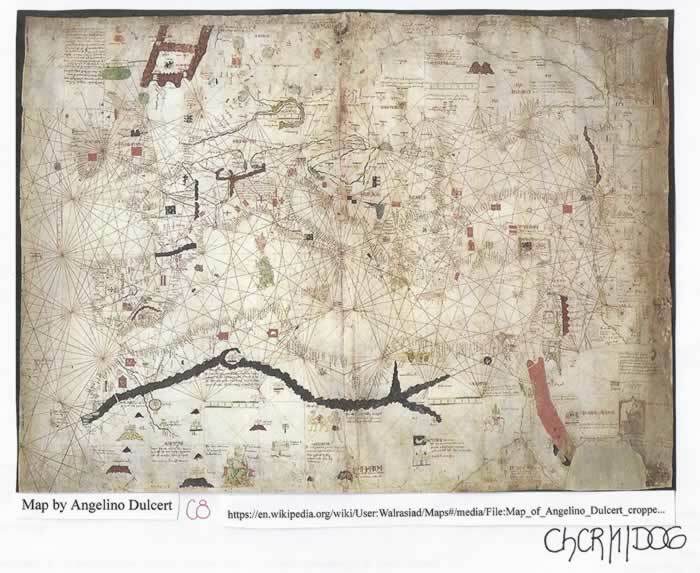 “It is not that there were not other cartographers—buxolers—as they were known—in the times of Angelino de Dolceto, like Guillermus Canterelli (Catalan?, Italian?) or Guillem Soler (Catalan), it is that we know little about them.” (G Llompart). The fact that Macia de Viladesters was part of the Cresques atelier at one time and produced his own named charts probably means that the original Genoese templates or their copies were used from c1300AD to at least 1430AD to draw charts on the Isle of Majorca. What is certain is that the Cresques atelier produced charts, visually beautiful, and no doubt accurate as they were copied from very good originals. 6 Motzo BR, “Il compass da navigare”, Cagliari University Sardinia, 1947. 8 Ferro, Gaetano, “The Genoese Cartographic Tradition and Christopher Columbus”, 1996, Istituto poligrafico e Zecca dello Stato, Libreria dello stato, Roma. M J Ferrar June 2015.